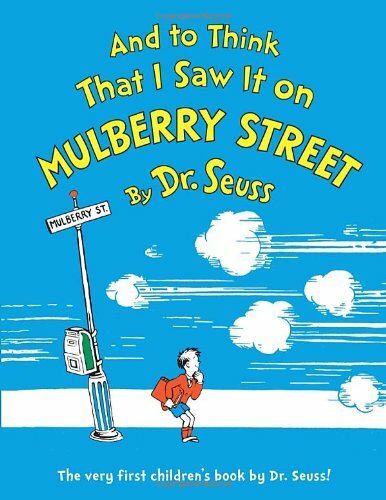 As I mentioned in my And to Think That I Saw It On Mulberry Street post, this book is one of my ALL TIME FAVORITE Dr. Seuss books! If you are going to check out what’s happening on your street you are probably going to need a good pair of binoculars so you don’t miss anything. Recycle a pair of paper tubes (i.e. toilet paper rolls) and paint them, add glitter, stickers, whatever appeals to you. Let them dry and glue or tape them together, hole punch on the two far sides and run a string or ribbon through to wear them. Once your Paper Tube Binoculars are dry and ready to go, spend some time exploring up and down your street (or all around your neighborhood) to see what things you can see! Did you have fun with that? Encourage your children to explore – with adult supervision, of course—other areas, too. Like the street at their best friends house or Grandma’s house. Be sure to get your own copy of And to Think That I Saw it on Mulberry Street!